It is used to measure social exclusion, economic inactivity and levels of disengagement from labour markets. It was created to measure levels of labour market participation amongst young people in the UK. In the UK, NEET measures the percentage of young people aged 16-24 who are not in work, education or training. The measure has been adopted by other countries, such as Japan and the EU. It is an important indicator of levels of inactivity amongst young people. Higher levels of NEET are seen as a cause for concern because of higher welfare payments, and the potential breakdown of normal social and economic activity. Recession. 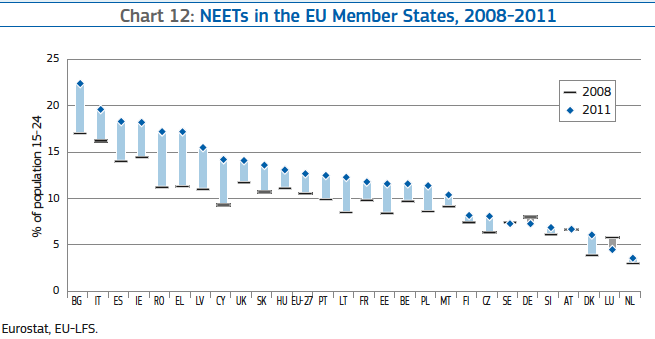 Levels of Neet has has increased in the 2008-13 EU recession. Lack of available education and training programmes. Education and training programmes that are not suitable. Higher levels of social disengagement. Lack of prospects can create feelings of social exclusion and contribute to riots that have intermittently been seen across Europe.